3-Ply Dinner Napkin 4.5" x 7.5"
AN EVENT IS NOT COMPLETE WITHOUT THE NAPKINS! Luncheon, Cocktail and Colored Cocktail Napkins are also available! 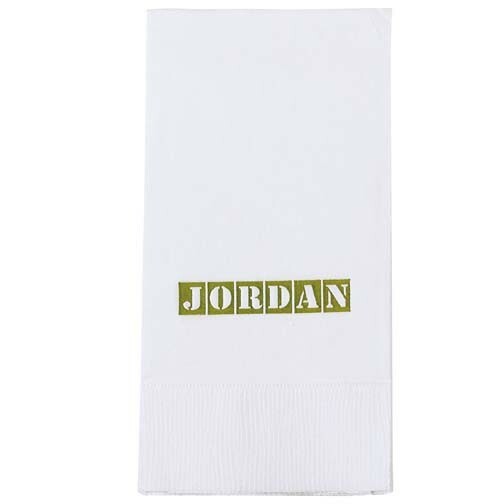 4.5” x 7.5” White 2-Ply Dinner Napkin, Made in USA, prices include a one color imprint, in one location. Foil hot-stamping is available at an additional charge. IMPRINT: Price Includes:a one color imprint in a 5.25"h x 3.5"w area. Orders of 10,000 and over will be web press printed and require 15 days production time plus a $50.00 (G) set up charge. FOIL HOT-STAMPED IMPRINT: See Options for additional charges.